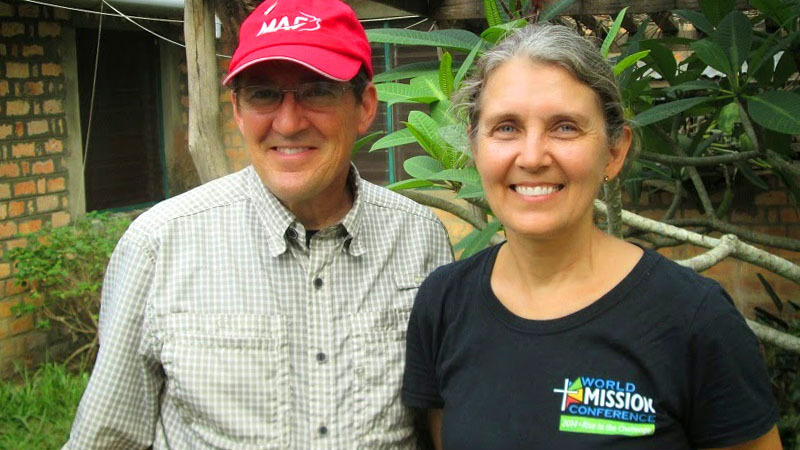 Posted on April 17, 2019 Pray for Glen and Rita Chapman training pastors and ministering to pastoral families in the Democratic Republic of the Congo. They write – We are in the midst of a building project. It is exciting at this point to watch the bright red roof go up. It will be a real landmark here at Kikongo. It is always inspiring to see our collective vision for a nice women’s dorm taking shape. Since we have upgraded to university level, we have had the challenge of housing single women. We have provisionally housed the women in a building we have used in the past as a nursery. Rita has described it as a “hot house”. It is not very adequate as a dorm. When we returned to Congo after our year of home assignment, we knew we would have the challenge of building a women’s dorm. We were not sure how we were going to manage, but our administrator introduced us to three men who had just completed building a medical dispensary in a nearby village. We really don’t have skilled builders here at Kikongo, so we were happy that these men showed up. We are very pleased with the builders, and the new dorm is definitely being built to last. We have tried to incorporate much of the brainstorming aspects the staff and girls pooled before the building was started. The girls suggested some personal storage space, so we are building shelves which can be locked. We have added a veranda at each end of the building so that the girls can have an outside visiting space. We have also added glass bricks to let the light in along the hallway. It will all be practical and pretty.